Chef Nancy Russman has worked in the kitchens of four-star restaurants and received national culinary and humanitarian awards, but her passion has always been teaching children about healthy food. When she started working with children and families at a homeless shelter in Louisville, Kentucky, she created a Culinary Arts Job Training Program that helped put parents to work. When she later worked for the Second Harvest Food Bank, she directed Kids Café, a program that feeds hungry children three nights a week. She expanded the Kids Café program from six community sites to fifteen and still works with children in Louisville schools and community centers. Chef Nancy believes people of all ages should be able to "feed their brains." 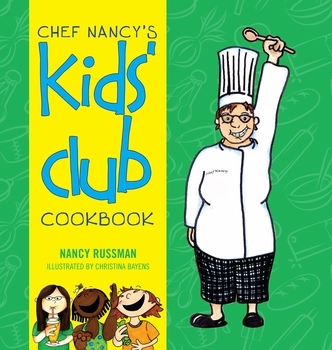 Chef Nancy's Kids' Club Cookbook contains easy recipes for fun snacks that can teach young people how to prepare healthy foods for themselves... without using knives or stoves!